Are you somewhere around Dambulla area in Central Province, Sri Lanka? Or are you checking places which give thrilled moment and also to view some famous heritages? If so, it’s a great opportunity to have a rock climbing as well to discover one of world’s famous and one of Sri Lanka’s main heritages, which is located near Dambulla, Sri Lanka and also Sigiriya Rock is one of great ancient cities in Sri Lanka, which proudly stands there with a unique shape and is 200m in height. Even though it is well known as a King Kashyapa’s Fortress as well as Kingdom, Sigiriya Rock has long history, which dates go back from 3rd Century BC to 1st century AD, where it was occupied by monks to dwell and had been inhabitant by folks. Because of power greediness, King Kashyapa had killed his father and was scared to his life and escaped from his brother, Prince Mugalan and finally he opted this picturesque place as his fortress as well as his Kingdom in the 5th century AD. During his 18 years’ reign time (from 477 AD to 495 AD), he added various marvels and beautiful things to this rocky site- Sigiriya, which are still visible to prove the worthy of this heritage. According to the history, after 18 year, King Kashyapa had a war with his brother, prince Mugalan, and then King Kashyapa had killed himself. 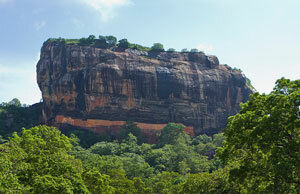 During King Kashyapa’s 18 years ruling time, he added many things which were impacted to value this significant look of Sigiriya Rock and due to his amazing work, he is recognized as a sovereign with supreme thoughts put into reality to create a Sri Lankan elegant wonder with high quality art and engineering skills that could even challenge the outer world constructions at that time. Even today, travelers are able to discover the amazing water technology at the summit of this rocky site as well as beautiful rock paintings called Sigiri Damsels (locally known as 'Sigiri Apsaras' ). Royal pleasure gardens, boulder gardens, rock sculptures, mirror wall, audience hall and moats and parts of ancient fortress are some of main attractions of Sigiriya Rock. However, this extraordinary site, Sigiriya Rock can’t be known as a historical site only, but also, it’s one of best picturesque and breath-stealing viewed rock. And Dambulla area and Matale district is is rich in lush world. And there are many other popular and beautiful mountains and rocks in Sri Lanka like Pidurutalagala, Kirigalpoththa and Worlds End that anyone can get lost with Sri Lanka’s uniqueness and amazing nature. Beauty of Matale can be discovered while experiencing and relaxing at best Hotels in Sri Lanka, especially at Matale Hotels.